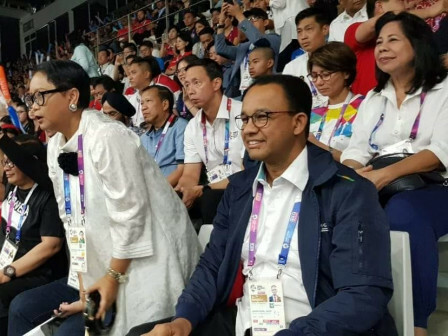 Jakarta Governor, Anies Baswedan is very proud and appreciates the struggle of Indonesian athletes at the XVIII Asian Games. It is because those who are earnest and relentless managed to rank in the top 4 out of the 45 participating countries.
" Entering the big four is a proud thing"
After witnessing the gold medal in the men's singles badminton between Jonatan Christie from Indonesia against Tienchen Chou from Taiwan, Anies hoped that Indonesia's achievements could continue to be maintained until the Asian Games is completed. "Entering the big four is a proud thing," he expressed, at Istora Senayan, Central Jakarta, Tuesday (8/28). It is certainly not only very proud of the athletes, yet it will also add to Indonesia's confidence as a nation. "This good performance and achievement is an extraordinary combination," he told. He is also very pleased with the number of local and foreign tourists who come to Jakarta during the Asian Games. "The economy is booming, starting from culinary, entertainment, and hospitality," he stated. As quoted by asiangames2018.id, up to 4.10 PM, Indonesia is still ranked fourth with 24 gold medals, 18 silvers, and 28 bronzes. The first rank is still achieved by China with 88 gold medals, 52 silvers, and 43 bronzes, followed by Japan with 43 gold medals, 37 silvers, and 57 bronzes, and South Korea with 31 gold medals, 37 silvers, and 44 bronzes.